Welcome to the first review in my A Year of Parenthood series! 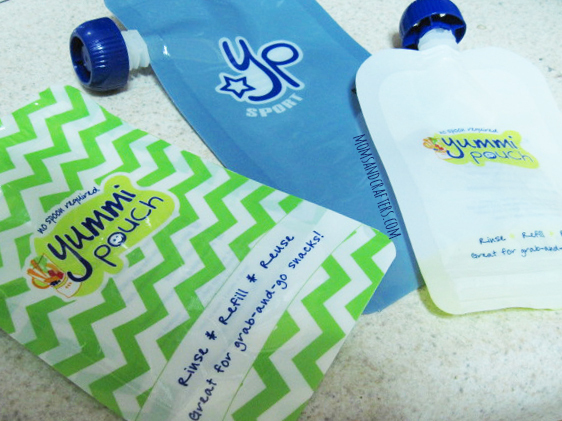 I was so excited to receive these samples of the Yummi Pouch to review! My baby loves eating on his own – when I try to spoon feed him, I need to give him a spoon as well so he can “help”. 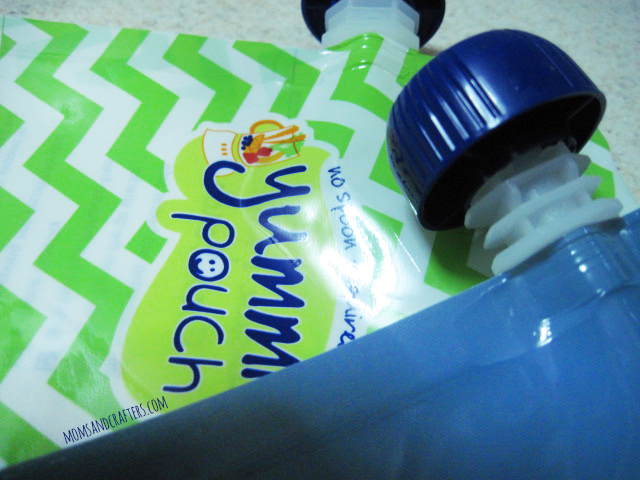 There are some foods, though, that get real messy when trying to do that… That’s where Yummi Pouch comes in. 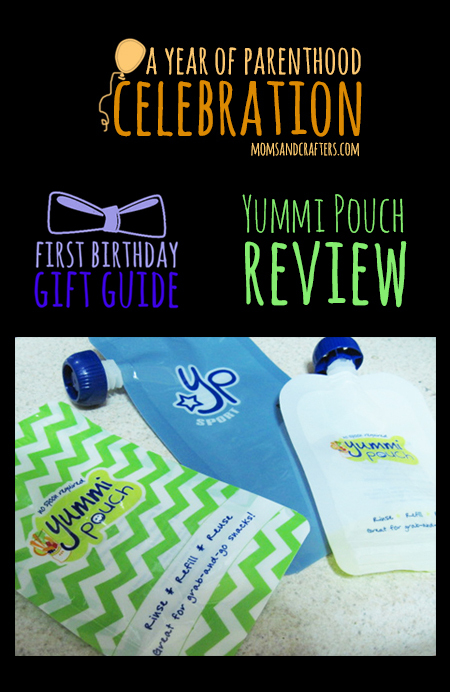 Yummi Pouch makes reusable food pouches that come in a variety of sizes and designs. I was sent three different designs. My first impression was that the plastic might be slightly thinner than I imagined. With further use, I saw that this was not a problem – it is extremely durable. The pattern on the “brights” set is adorable, and my baby loves it too! It comes in a variety of sizes, which I felt was important, as you can fit it better to various portion sizes. I used the 2.5 oz capacity for chicken puree from the jar. In the 6 oz. capacity, I mix for him a combination of chicken or meat puree and sweet potato. The Vitamin C in the sweet potato helps the iron absorb. My baby’s favorite food is applesauce mixed with yogurt. I combine a 4 oz. jar of apple or banana baby food with 4-6 oz. plain full fat yogurt and he eats it from the 10 oz. pouch. Previously I used a straw training cup to serve that to him, but it was a nightmare to clean! Yummi Pouch has backed them with a 30 day guarantee. 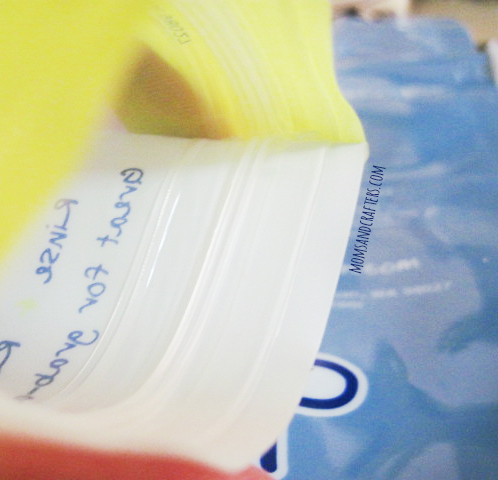 The “sport” and “classic” are marked with a “fill line” for maximum capacity. The “mini” and “classic” have a space to mark date and contents with a dry erase marker. I found them very easy to clean with a bottle brush (as the company suggested.) I used a spout brush which I anyway have handy for the opening – and it works perfectly! My baby loved the independence of eating on his own – he has the control. I love the independence of having my baby eat on his own…. ! They store flat so they take up virtually no space in my tiny apartment, with limited storage. The caps all fit each other – the size is universal, so I don’t have to play a matching game. 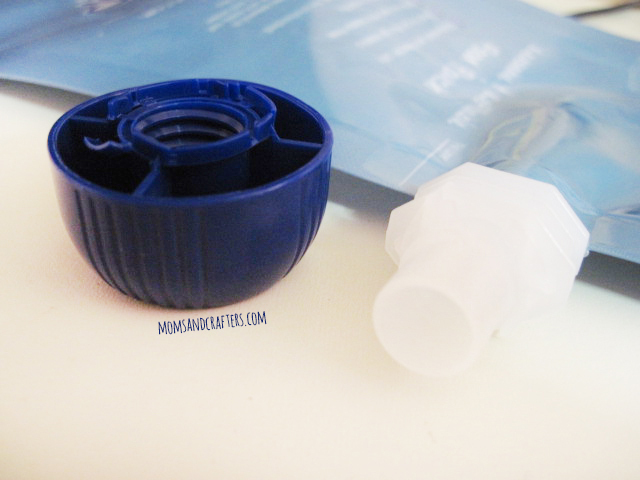 I feel as though the quality of the cap is not the best – it’s the same cap you get on the disposable pouches. I’m afraid it’ll break each time I open it. I’m also having some trouble with the seal on the zipper. I had a couple of messes after I tried to close it securely a few times. They are supposed to stand up for easy filling, however I did not find it easy to open fully to stand. Tip: They do recommend using a spouted measuring cup for filling. I’ve been using a spoon. Age: I’ve been trying it with my almost one year old and he’s slowly getting the hang of it. I have friends who have used these from as young as six months. It’s also great for toddlers and young children who enjoy eating out of pouches (especially the “sport” pouch). Warning: The cap is a choking hazard so remove it before giving to a child under three, and keep out of reach. I highly recommend this for families who are trying to better the environment, for people who are trying to save money, and for busy moms who want their children to be able to self-feed purees. This is great for feeding on the go! Final score is 4/5 stars. I love it and it’s great and functional – I use it daily. The only thing I would improve on is the seal on the zip closure. Store – Get 10% off with code PARTY4YP! Disclaimer: I received the above products free of charge for review purposes. As you can see, all opinions are my own and remain unbiased. My daughter makes her own baby food. 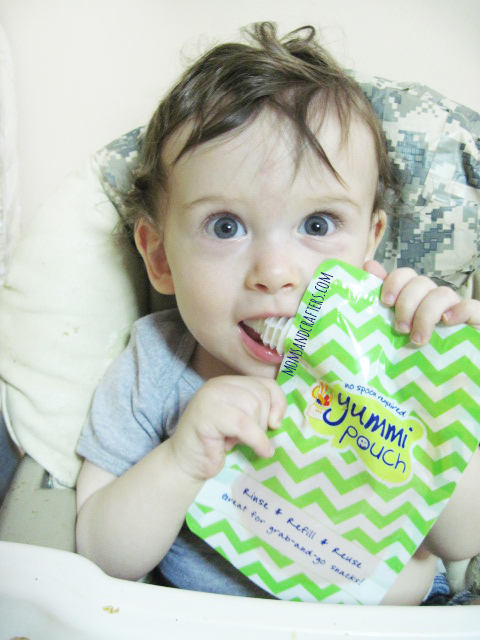 Our grandson, who is turning 1 year old in November, will soon be able to hold on to the Yummi Pouch. I think he AND my daughter will like that. Not only will the pouch be convenient. But, like the way they designed it. It’s durable and reusable. It’s easier to clean, than you’d think. And, the colors are appealing. Thanks for reviewing this product. I have considered these in the past, but my son was never big on the pouches, even though my other kids were. Then today, I offered him one and he loved it. I am definitely going to consider these again. Some children learn faster than others. For my baby as well it took time until he really learned how, and until then it bothered him as he wanted his food. But since he’s learned, they are a life saver! Wow this look really good easy for the kids and I love that the dishwasher and freezer safe. I would like these for my little one who is almost 6 months old. I have never used any of the pouched food before, my 2 girls are older and they weren’t around then, or at least not as popular and I didn’t notice them. Just started my 6 month old on baby food and boy is he a messy eater! These seem to be a good alternative to a less mess meal. Only thing that concerns me is the ziploc closure might not stay sealed. Thanks for the great review. 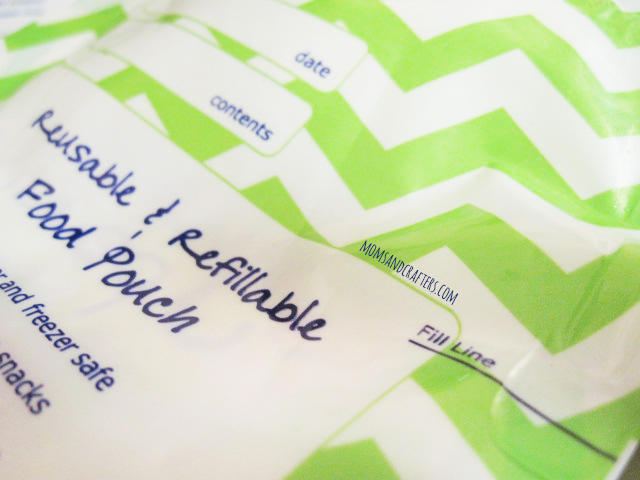 I’ve been wondering about these reusable pouches. I’m glad to know they are easy to clean and durable.